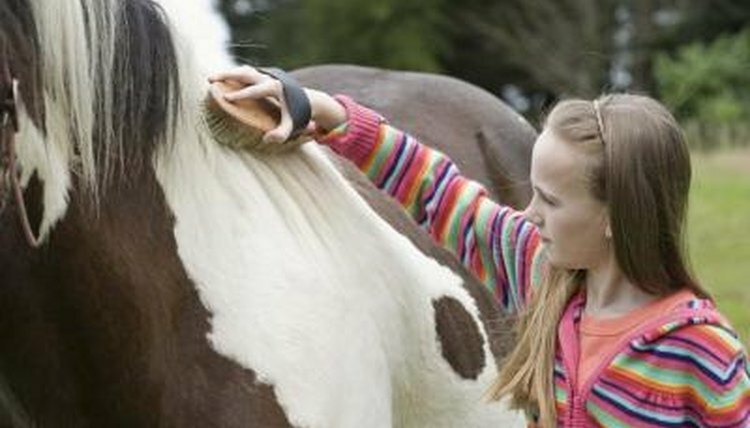 Taking care of your horse's mane, tail and coat will keep him looking healthy and attractive. Grooming promotes good hygiene as well as positive interaction and bonding between you and your horse. While a wide assortment of grooming products are available for purchase, you can save time and money by using homemade solutions to common grooming problems. Good old-fashioned time and elbow grease are the most effective no cost way to keep your horse looking clean and shiny. Regular maintenance and consistent basic grooming will do more to keep your horse looking good than spending one or two days a month trying to completely overhaul his appearance and scrub away a week's worth of grime. Buy a good quality set of grooming tools and use them every day. You will need a body brush, curry comb, face brush, hoof pick and mane and tail comb. White vinegar is a great natural and non-toxic cleaner. You can wash your horse using white vinegar to remove dirt and lift stains off the coat. It will also help detangle your horse's mane and tail. You can either dilute the vinegar 50-50 with water for basic washing or leave it undiluted to remove stubborn stains. The downside of using white vinegar is that it does have a bit of a strong smell. The bright side is that vinegar is an ingredient in quite a few homemade horse fly spray recipes and may help deter pesky biting flies and gnats. A severely tangled mane or tail can take hours to brush out. Using conditioner can help make knots come out more easily, but conditioners can be expensive. Substitute baby oil or mineral oil for conditioner when you are trying to detangle stubborn knots. The oils will help the hair slip loose of the tangles without being damaged or broken in the process. A word of warning, though -- you will need to thoroughly wash the oil out after you have the knot out or it will attract dirt very quickly. You can also use oils to polish and shine the muzzle, face, coat and hooves; however, be careful not to over use it. Oils can magnify the effect of the sun on skin and accelerate sunburns. Making your own shampoo can save you money and ensures that you know exactly what is going on your horse's skin. This can be especially useful if your horse has skin allergies. A basic shampoo mixture from Holistic Horse involves steeping 10 chamomile tea bags in boiling water for an hour, then adding 1 cup liquid castile soap and 1/2 tablespoon glycerin with a couple drops of your choice in essential oils. A second recipe recommends using 1 cup aloe vera gel, 1 cup water, 1 cup liquid castile soap, 4 teaspoons glycerin and 1 teaspoon rice bran oil or avocado.